(26” ht x 50” w – $10.00) A species hosta (‘Sagae’ is its gold edged sport!) which forms an upright mound of blue green foliage (turning to dark green as season progresses) with VERY thick substance and wavy margins. Pale lavender flowers and limited! 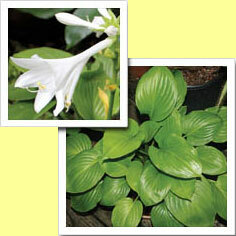 (12” ht x 18” w – $7.00) This species hosta has lance shaped, very shiny dark green foliage and very light lavender flowers. (24” ht x 60” w – $11.00) This “August Lily” sport has all the great features of her parent (smooth, shiny, apple-green foliage) with the added bonus of DOUBLE heavily fragrant flowers! Heavenly! Photo courtesy Q and Z Nursery. (20” ht x 40” w – $22.00) This tetraploid sport of the August Lily has her parent’s shiny, bright green, smooth textured foliage, with a bonus of a much more compact growth habit and larger, white, and extremely fragrant flowers. A good grower, and one you’ll want to site near you so you can enjoy her fantastic floriferous-nicity!!! Photo courtesy Q & Z Nursery. (13” ht x 22” w – $15.00) Another species hosta, this one has very distinctive and unusual yellowish green leaves with a waxy white underside. Interesting note—this was because in the wild they are found growing on sunny, south facing canyon walls, clinging to rock ledges. The white undercoating on the leaves and petioles was an adaptation to protect against the intense summer heat (clever hosta!). 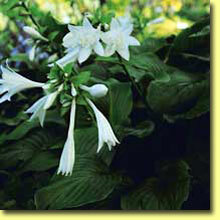 Generally, they grow few but very large leaves that spread horizontally, and have white flowers. Very limited supply! (9” ht x 25” w – $12.00) I love this Hosta and used to carry it, but my numbers got too low until now. I still don’t have many of these available, but I really think EVERY hosta collector should have one! This species hosta forms a small mound of VERY shiny, smooth, deep green foliage and has distinctive narrow-petaled flowers. A great hosta for breeding programs; distinctive and great!